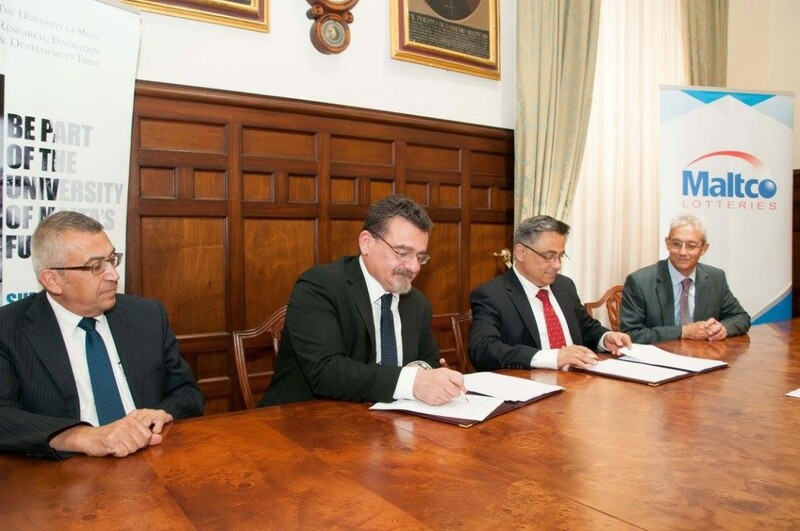 Maltco Lotteries, Malta’s national lottery brand, are collaborating with the University of Malta and have signed an agreement to support the University’s Institute of Digital Games. This is an opportunity for the national lottery custodian to show support for and shine a spotlight on this ever growing industry. This support was initiated by Maltco Lotteries and will benefit ongoing research initiatives at the University. The funds will be channelled through RIDT. In the local gaming scene Maltco Lotteries are on the front line, interacting with customers and ensuring that players receive the best entertainment experience possible. For the first time ever Maltco Lotteries has initiated a collaboration with the University’s Institute of Digital Games for a minimum of two consecutive years, starting June 2016. Talented University of Malta students selected on merit by an independent panel at the University will have a post in the Institute of Digital Games, fully sponsored by Maltco Lotteries. This will give more opportunities in Digital Game analysis, design and technology in Malta and encourage more students, both nationally and internationally, to enrol in the M.Sc. in Digital Games course at the University of Malta. Maltco is a major contributor to Malta’s economy through job creation and investment as well as to social well-being through an on-going programme of charitable donations to help the most in need in the community. The Institute of Digital Games was established in 2013 at the University of Malta to deliver world-class, postgraduate education and research in game studies, game design and game technology. The international team of researchers at the Institute come from a variety of disciplinary backgrounds including literature, media studies, computer science, human-computer interaction and design. Researchers of the Institute have been and are currently involved in numerous externally funded research projects, editorial boards of top academic journals and programme committees of the most prestigious conferences in games research. The Institute of Digital Games is one of the top international centres in this discipline and the work it carries out is at the forefront of innovative games research. Maltco, being part of the INTRALOT group, which is present in 57 jurisdictions across all 5 continents, will help the University raise the profile of the Institute internationally and attract more students to the flagship M.Sc. in Digital Games. For further information email: info@maltco.net, visit the Maltco website or call 2388 3000.